Everyone has their personal preference and I like my coffee dark, strong, full bodied and without milk. In my Sainsbury’s Continental Fairtrade coffee beans review I’ll show that if you share a love of this type of coffee you need not pay through the nose. 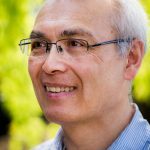 I’ll also compare Sainsbury’s Continental Fairtrade coffee beans with Aldi’s espresso beans, which are also Fairtrade, I reviewed a few days ago. One pleasant surprise when purchasing my pack of Sainsbury’s dark roast Continental coffee beans for this review was price. The already very competitive price of £2.30 for half a pound (227g) had been reduced to £2.05. I have noticed in general that coffee prices have fallen a bit this year and here is further evidence. At 14g for a double espresso or an Americano, that works out at just about 13 pence per cup. Sainsbury’s dark roast Continental coffee beans are particularly dark and they have a more oily appearance. I don’t have any problems grinding them with my Porlex hand grinder but I have seen some online reports from people whose grinders have become blocked because the oiliness of the beans makes them stick together. 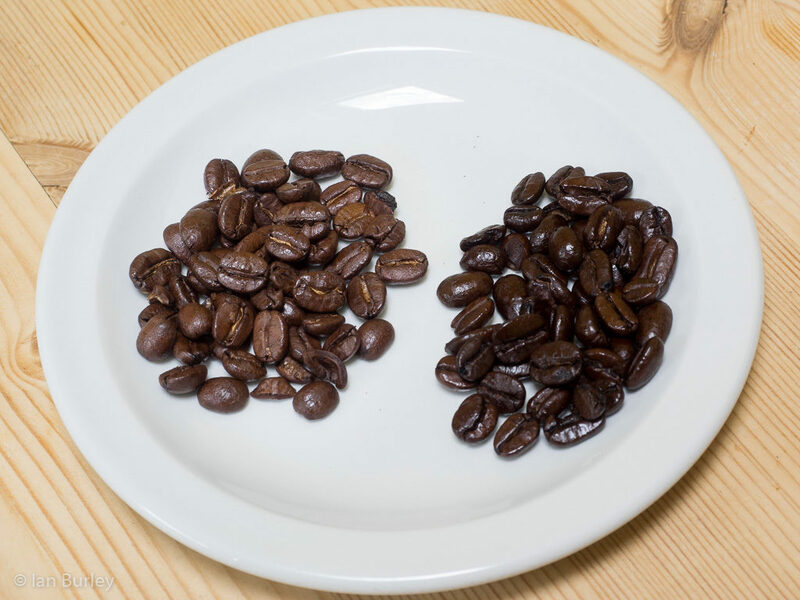 You can see the lighter colour of the Aldi Alcafé espresso coffee beans on the left compared to the darker roast and more oily Sainsbury’s Continental Fairtrade coffee beans on the right. I use Sainsbury’s Continental Fairtrade coffee beans for both espresso shots and Americanos (espresso topped up with water). There is definitely a harder edge and a greater intensity, which I personally like. The bag is emblazoned with a 5/5 rating for coffee strength and I am certainly not disagreeing. If there is a trace of accompanying bitterness I can forgive it. The intensity you savour has a curranty aspect to it. It’s not fruity or flowery, the ‘currant’ dimension is more akin to the after taste from blackcurrant jam. For espressos shots I enjoy Sainsbury’s Continental Fairtrade coffee but unlike the Aldi Alcafé espresso beans I do need a little sweetening. My daughter thinks Sainsbury’s Continental Fairtrade coffee is too strong for her cappuccinos. If I have any complaints there are only two I can think of. Very occasionally I have come across a bag that is not as impressive as all the others, but this is only very occasional. 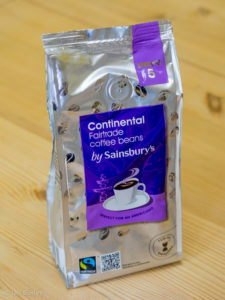 Secondly, Sainsbury’s pack some of their own brand coffee beans in bags with self-securing thin metal strips but not with their Continental Fairtrade coffee beans. So there you have it; if you like strong dark coffee at a very competitive price you should definitely try Sainsbury’s Continental Fairtrade coffee beans. I recently noticed that this and some of Sainsbury’s other own-brand coffee beans have been reduced to £1.85.